Aubrey Plaza is excellent as an Instagram stalker in Matt Spicer's bitingly funny and deeply uncomfortable social media satire. Matt Spicer’s Ingrid Goes West plays like a razor sharp and deeply uncomfortable update of Single White Female for the digital age, skewering social media and online celebrity through the story of one damaged twentysomething named Ingrid, played by a never-better Aubrey Plaza. It’s a satire that’s as dark as it is funny, dealing with issues of loneliness and mental illness and the ways in which social media can exacerbate those issues. Ingrid is a loner with an unhealthy Instagram obsession, a fixation that frequently seeps into her offline world. Even a stint in a mental hospital doesn’t help: no sooner is Ingrid back home, than she discovers another online celebrity to obsess over: Taylor Sloane (Elizabeth Olsen), an Instagram It-girl who leads a seemingly perfect life of gallery openings, avocado toast and magic hour selfies. Taylor makes the mistake of replying to one of Ingrid’s comments, giving Ingrid enough incentive to travel to LA to insert herself into Taylor’s life. The film, written by Spicer and David Branson Smith, balances comedy with scenes that are thunderously uncomfortable to watch. It starts off funny as the script perfectly skewers Taylor’s superficial LA lifestyle, which includes pretentious restaurants where the waiters ask, “How can I nourish you today?”. Her home is a hipster haven which she shares with her husband Ezra (Wyatt Russell), a would-be artist whose style involves stamping a hashtag on top of an existing painting. The satire is sharply written and Taylor is a perfect encapsulation of the kind of vapid ‘influencer’ whose life is a shiny façade designed to garner likes and very little else. Through a series of lies and contrivances, Ingrid worms her way into Taylor’s life and the two become friends. Though to someone like Taylor, telling someone they’re your “favourite person ever” means absolutely nothing; to Ingrid, it means everything. Spicer ratchets up the tension as Ingrid gets deeper and deeper into Taylor’s life and we wonder how and when it’s all going to come unstuck. Spicer crafts scenes that are so thunderingly awkward that they’re almost physically painful and, as the film gets darker and darker, it becomes even more discomfiting. As Taylor moves on to other, cooler friends and starts to forget about her, Ingrid’s behaviour becomes increasingly erratic and veers off towards violence that feels like a step too far for the character and the story. As it gets bogged down in a kidnap plot, the biting humour and more insightful character moments take a back seat, though thankfully Spicer has the nous to steer the film back towards an ending that feels like a genuine outcome for Ingrid who, despite the awful choices she makes, comes to be a sympathetic character by the end. Much of that comes down to Plaza, who has found a role that is a perfect fit for her mix of snark and vague, deep-seated darkness. She throws herself into an unflattering and at times deeply unlikeable role with gusto, convincing as both the sad, lonely girl crying in her room over an Instagram feed and the calculating, manipulative woman who can insinuate herself into a stranger’s life. Though he is lumbered with a Batman obsession that never entirely works, the standout among the supporting cast is O’Shea Jackson Jr, who projects easy-going charisma and barely-hidden sensitivity as Ingrid’s landlord. 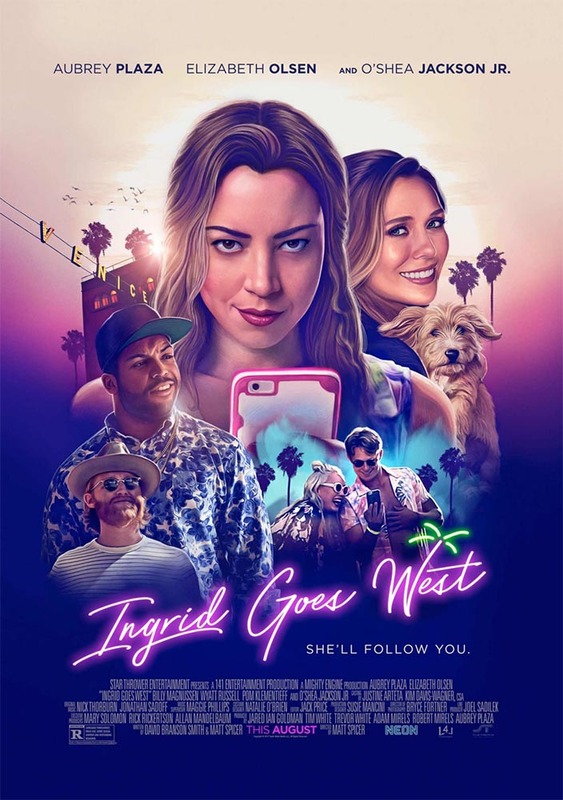 Though there are missteps along the way, Ingrid Goes West is a sharp and insightful debut from Matt Spicer that lays bare the toxic side of social media culture. A darkly funny character study shot in the garish haze of an Instagram filter, it’s a confident and vibrant debut from Matt Spicer that provides Aubrey Plaza with the perfect vehicle for her talents.